Lagos was an important harbour at the time of the Great Discoveries and it was from here that most of the African expeditions put to sea. Surrounding the old centre of this former capital of the Algarve (1576 to 1756) still stands an almost complete city wall. Apart from being a seaside resort and a fishing port, Lagos is also an important yachting centre organising international regattas. Still a working town with a population of around 18,000 , the most attractive part is undoubtedly the old town with its narrow winding streets, churches and pedestrianised area, all of which ooze charm. The town’s long history is reflected in many of the older buildings, with the old town itself flanked by the walls of an old Roman fortress.This central hub is surrounded by more modern residential and hotel developments including a large marina. This resort suits wide range of ages and interests from beach-loving families and singles to history buffs, golfers and nature lovers. 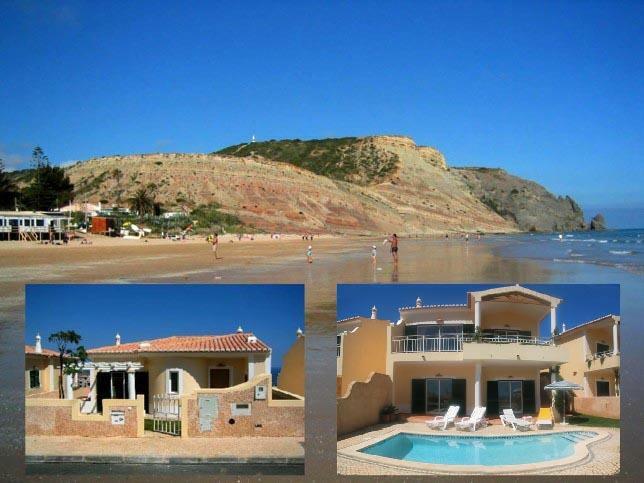 The area has good-value hotels and self-catering accommodation to suit all markets. 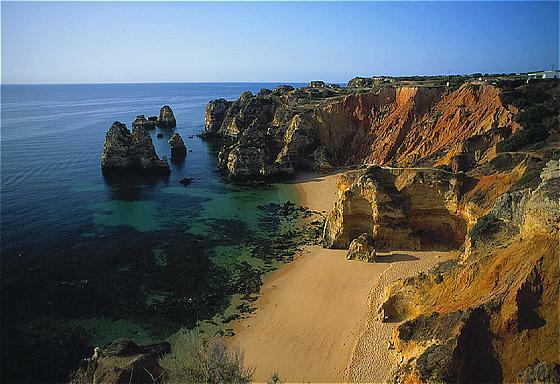 Locality: Lagos is 50 miles west of Faro and its airport, 175 mls S of Lisbon, 10 mls W of Portimao. It is positioned on end of wide bay, and built around deep-water harbour with hilly residential area to North. 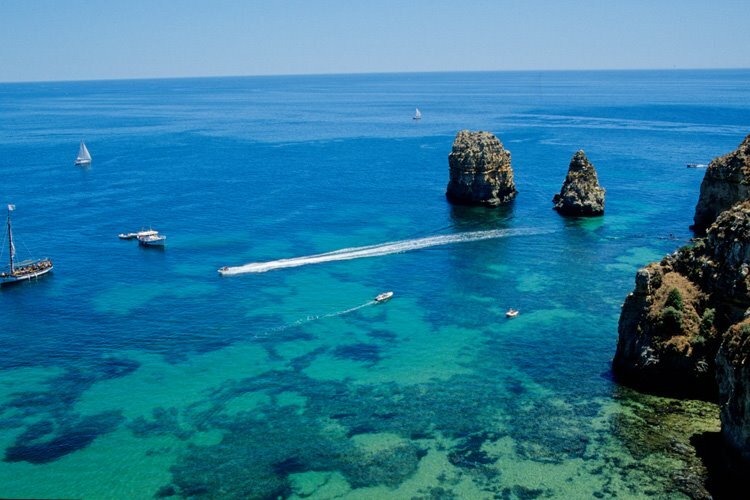 There is little need to do anything more to enjoy your holiday other than sprawl on the sandy beach with an occasional dip in the ocean, but those who need more activity can choose between dozens of pursuits like sailing, wind-surfing, fishing, para-sailing, micro-light flights and scuba diving. Golf is a major attraction here as it is throughout the Algarve, with the Palmares and Alto courses nearby, offering a round with sea views. There is also the challenge of the Penina Championship Course, site of many a Portuguese Open. Those who hire a car will be well-rewarded in exploring the adjacent coastline and seeking out unspoilt villages and beaches. There are also a few sightseeing opportunities in the town, including an interesting museum. 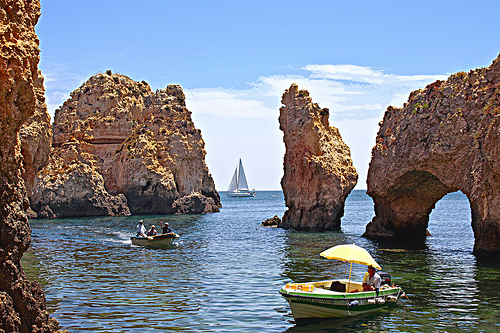 Eating out is part of the pleasure of a holiday on the Algarve, and Lagos offers the best of the best choices of establishments in which to indulge. Seafood lovers will be ecstatic, but no-one , even vegetarians, will be disappointed or go hungry. A good choice at the marina is the do Cais Bistro, which serves waterfront breakfasts, lunches and dinners seven days a week. For creative international cuisine in the town centre (including vegetarian dishes) Duquesa Restaurante is hard to beat. Truly gourmet local specialities like pork chops with figs, savoury shrimp and succulent shellfish, are enjoyed at the Don Sebastiao tavern in the old town pedestrian area. This restaurant also has the best wine cellar in town. There is no shortage of opportunity for “boogie nights” in lively Lagos, with several energetic dance clubs and character-filled bars strewn through the main part of town. Of the bars most popular are Bar Amuras at the marina, the Red Eye Bar on the Rue Candido dos Reis, and Zanzibar on the Rua 25 de Abril. Most have music, darts and pool tables and Sky TV sports channels. Top of the pops among clubs is the Phoenix on Rua des Goncalo where the 18-30s jive till 6am.